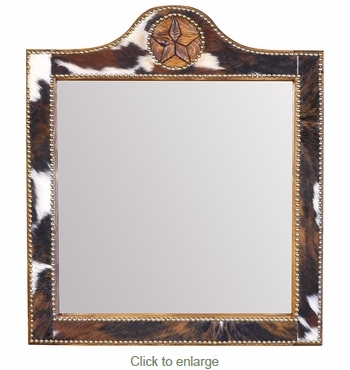 Add a touch of rustic elegance with this handcrafted Texas lone star mirror with cowhide border. This large wall mirror will make a grand focal piece in your home or cabin. The cowhide frame is edged with brass clavos. The one-of-a-kind character of our western decor is enhanced by the light and dark patina stains and premium selected cowhide. Handcrafted by artisans in Mexico, our western cowhide furniture is perfect for southwest ranch or cabin decor. Mirrors are carefully packed to ensure they arrive to you safely. Each mirror is a unique creation, so expect some variations in appearance of cowhide and stains.